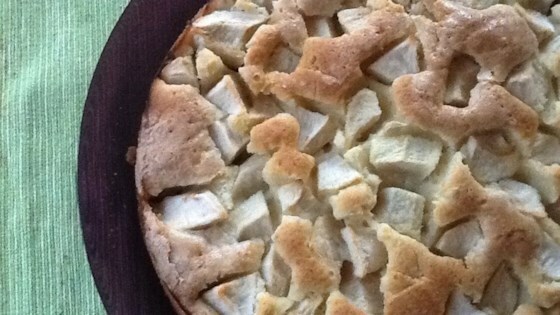 "This Italian apple cake recipe is from my mom and reminds me of my childhood. It tastes delicious, and I bake it for my family now." Pour batter into the prepared pie plate. Distribute apple slices in a thick layer on top of the batter. Dot with cubed butter and sprinkle with 1/4 cup sugar. Bake in the preheated oven until a toothpick inserted into the center comes out clean, 30 to 45 minutes. Cool on a wire rack for 5 minutes. Run a table knife around the edges to loosen. Invert carefully onto a serving plate or cooling rack. Let cool completely.